Find our cheapest flights to Taupo from Auckland. An inland sea of tranquillity, Taupo is a recreational paradise where it's possible to ski in the morning, play golf in the afternoon and catch a trout in the evening. With an area of more than 600 square kilometres, Lake Taupo is immense as well as beautiful. Its many bays and beaches are sprinkled with pumice stone, a clue to the lake's explosive beginning - it was created around 2,000 years ago by a gigantic volcanic eruption. Much more than a dramatic piece of scenery, Lake Taupo is a stage for boat trips, fly-fishing, parasailing and sea kayaking. And in summer it's a glorious place for a swim. Geothermal energy is used by hotels, motels and lodges to heat water for hot spas - a delicious way to unwind at the end of the day. A short drive north of Taupo township is one of New Zealand's iconic attractions - Huka Falls. This thundering waterfall provides a fantastic photo opportunity - more than 220,000 litres of water tumbles over the cliff face per second! Another natural attraction in this area is the Craters of the Moon geothermal reserve - a hissing, steaming, bubbling entertainment that costs next-to-nothing. The plentiful geothermal energy you're seeing here is a vast resource. It drives the nearby Wairakei Power Station and is used by hotels, motels and lodges to heat water for hot spas - a delicious way to unwind at the end of the day. Every year Taupo hosts events that lure thousands of recreational athletes who like their sporting challenges accompanied by huge scenery. The Lake Taupo Cycle Challenge is the biggest of these. From humble beginnings in the 1970s, when just 26 people signed up, it has grown into New Zealand's biggest cycling event. People come from all over the world to circumnavigate the lake - a journey of 160km. Other annual sporting competitions include a marathon, ultra-marathon and triathlon, as well as numerous mountain biking challenges. If flicking a fly rod is your idea of fun, head for Turangi at the southern end of the lake. This town is all about trout fishing - rainbow and brown. A local guide can help you to find the fish and provide pointers on your casting. On a clear day you can't help but notice the massive volcanoes that dominate the southern skyline. Ruapehu, Tongariro and Ngauruhoe are active, but sedate enough to provide visitors with unforgettable climbing, skiing and hiking experiences. 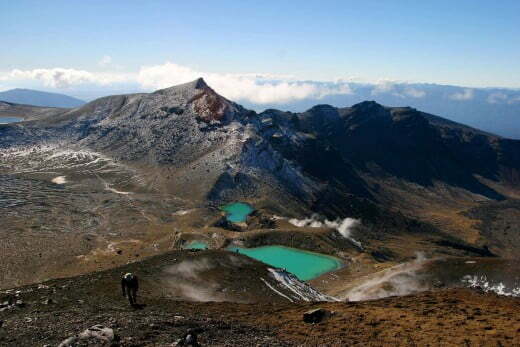 If you're keen to do the Tongariro Alpine Crossing, a world famous one-day hike, National Park Village is the place to get organised. Taupo is a true all-seasons destination, although if you're planning to do the Tongariro Crossing you'll need to choose spring, summer or autumn. Although it doesn't snow in Taupo, winter temperatures can drop to sub-zero (Celsius) at night. Lakeside trees put on a gorgeous colour show in autumn.